Ce cours est également disponible en français. Chronic poverty and recurrent shocks—like droughts, floods, and conflict—are driving many of the same communities into crisis year after year. In partnership with host governments, regional institutions, and other humanitarian and development partners, USAID is helping the global community pivot from being reactive in the wake of disaster to driving evidence-based investments that enable people, households, communities, systems and countries to better manage and adapt to inevitable shocks. This course introduces learners to the basics of resilience as an analytic, programmatic and organizing concept and discusses USAID’s resilience work to date. As an introduction, it is followed by Online Resilience Training: Measurement, Livelihood Diversification, and Sustainable Poverty Escapes, an advanced course, on this topic. Click on the video to start the course! 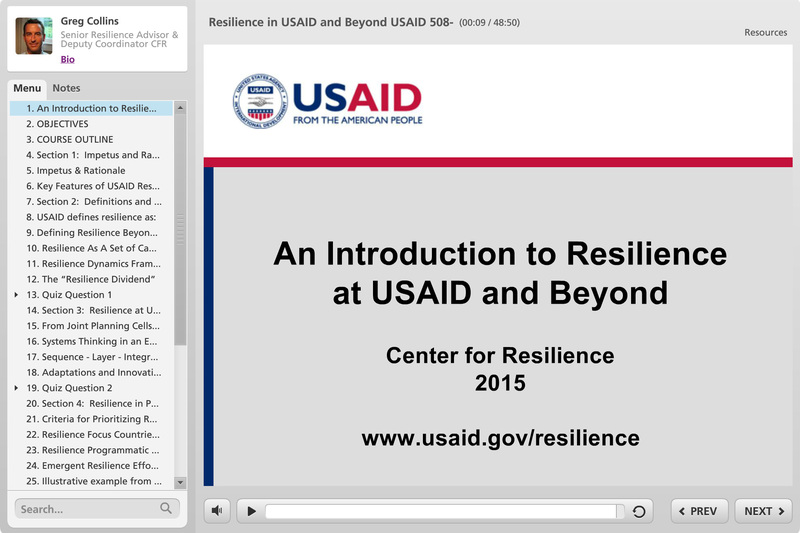 Module 3: Resilience at USAID: What is different? For more information, contact: resilience@usaid.gov. This course was designed for USAID staff and external partners wanting an introduction to resilience and how the concept applies to USAID programs.